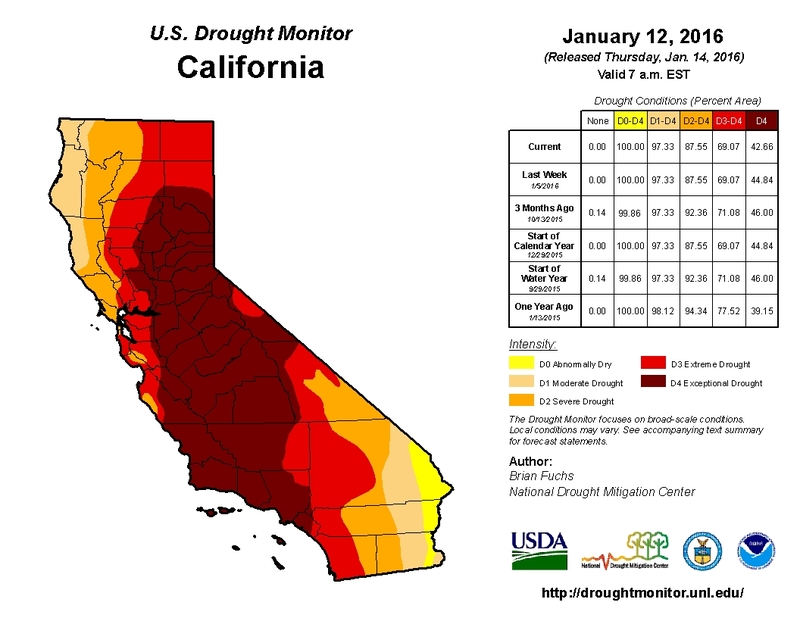 Since the declaration of the drought emergency in January 2014, the State of California has worked to appropriate $3.7 billion to assist drought-impacted communities, provide additional resources for critical water infrastructure projects, and respond to drought-related wildlife emergencies. Governor Brown’s proposed 2016/17 state budget would provide an additional $323.1 million on a one-time basis to continue emergency response to the drought. 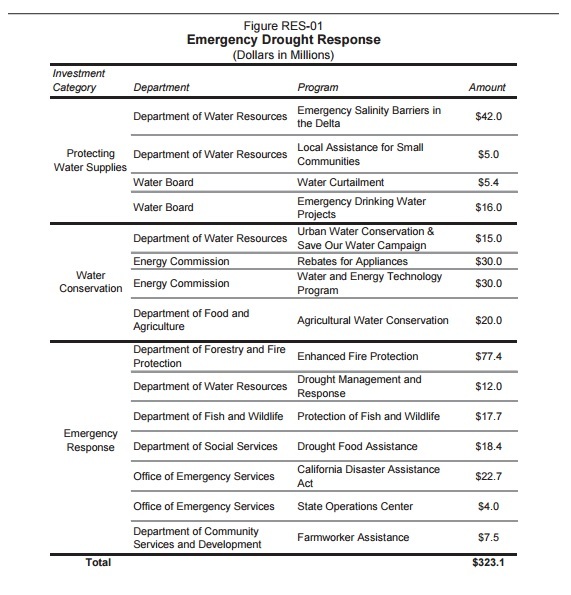 The budget includes $68.5 million for protecting water supplies, such as emergency salinity barriers and emergency drinking water projects; $95 million for water conservation, such as appliance rebates and education programs; and $159.7 million for emergency response, such as food assistance and fire protection. Aside for the drought measures, the proposed budget includes funding for implementing the California Water Action Plan, a five-year roadmap for sustainable water management. Notable funding increases include $385 million to support projects that meet the state’s commitments under the Klamath Agreements ($250 million), the Central Valley Project Improvement Act ($90 million), and the San Joaquin River Settlements ($45 million). An additional $80 million would go toward Salton Sea Restoration for dust suppression and expansion of migratory bird habitat. The Salton Sea is an important ecological hotspot, with hundreds of thousands of resident and migratory birds each year, and the funding would help to complete two plans to address health and environmental consequences of the lake’s decline, which is expected to accelerate in 2018 when water deliveries by the Imperial Irrigation District to the saline lake will end. Following the release of the 2016/17 budget proposal, the state published its Water Action Plan 2016 Update to reflect the progress that took place since January 2014 as well as future activities. The Plan provides the foundation for Proposition 1, the 2014 water bond, and the administration’s legislative agenda to work toward sustainable water management solutions. Commitment to making conservation a California way of life is emphasized through an expansion of agricultural and urban water conservation and efficiency measures to exceed SBX7 7 targets and a requirement for all agricultural water districts that supply water to 10,000 to 25,000 acres of irrigated lands to develop agricultural water management plans. The CA Water Action Plan also highlights the need to implement the controversial Delta Plan, which was bifurcated into the California WaterFix (water supply and delivery infrastructure initiative) and the California EcoRestore (habitat restoration and ecosystem improvement initiative). The State Water Board recently adopted a statewide Storm Water Strategy to support strategic expansion of stormwater capture projects. Once considered as a water quality problem, storm water can help to augment the water supply via green infrastructure, such as permeable pavements, rain gardens, and bioretention cells. On January 5, the State Water Board authorized the sale of $1.2 billion in revenue bonds to fund additional recycled water projects. The money is an extension of the existing Clean Water State Revolving Fund. The U.S. Forest Service has begun an investigation into Nestlé Waters North America’s bottling operations in San Bernardino National Forest, Southern California. It has been collecting an annual fee of $524 from the company, which has been withdrawing water under an expired permit. The piping system draws about 68,000 gallons of water a day on average out of the forest. The Forest Service does not collect fees for the water. The current El Niño, dubbed “Darth Niño,” has caused widespread flooding in Southern California. Some flooding and other impacts across Northern California are expected this week. Despite heavy rainfall, the drought period is likely to continue as major reservoirs are still below historical average (see drought status below) and the storms are not expected to boost groundwater to normal levels after four years of drought. California urban users missed the 25% statewide water conservation goal in November, but have saved a combined 26% since the mandate was implemented in June 2014. News of regions having missed local monthly conservation targets, such as the San Diego region, Modesto, Ceres, and Coachella Valley, continue to surface across the internet. Persistent failure to meet this goal has led the Eastern Municipal Water District, in Riverside County, to impose a cut of 70% to residential irrigation. To prepare for persistent drought conditions, the State Water Board released a draft emergency regulation to continue urban water conservation until October 31, 2016. The World Economic Forum’s 2016 Global Risks Report ranked water crises as the top global risk for the next 10 years. It is the first time in the report’s publishing history (since 2006) that an environmental risk topped the ranking. The report is based on global risk outlook assessments by about 750 experts and decision-makers. Exceptional drought conditions have improved by about 2.2 percentage points since last week, reducing the affected area to 42.66% of the entire state. The statewide snow-water equivalent average has increased to 15.9”, or about 111% of the normal average for January 19. 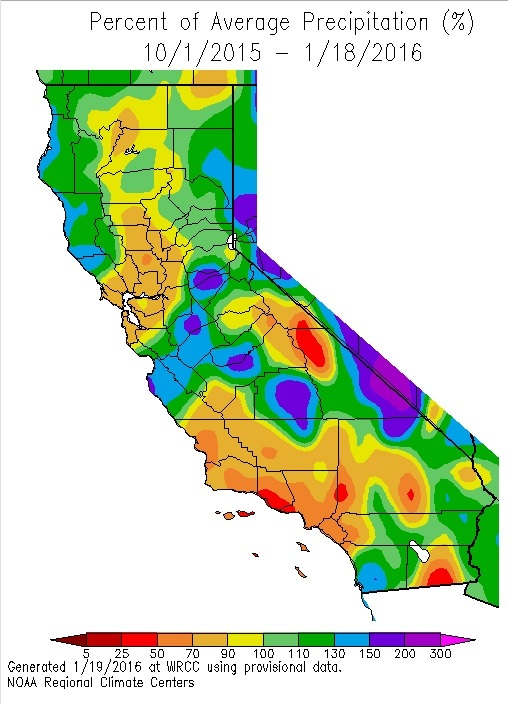 Central Sierra experiences above-normal snow-water depth at 115% of the normal average, while it is 91% for the Southern Sierra. Snowpack’s water content is far greater than one year ago. See here for interactive regional snowpack plots. 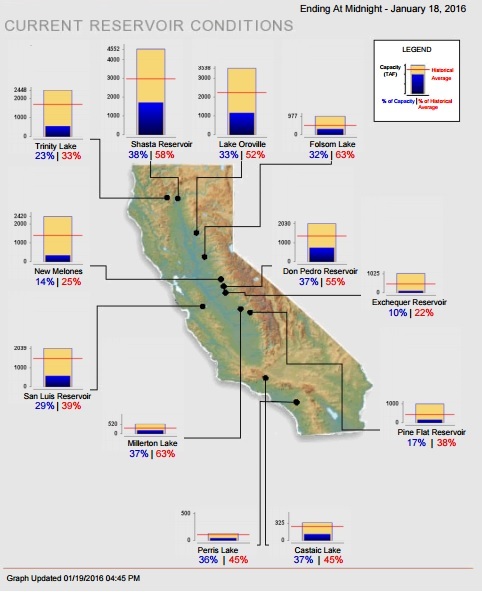 Water levels in California’s major reservoirs (representing 27.3 million acre-feet of storage) are now at 30% of statewide capacity and about 50.17% of group historical average. Current levels are about 80% of what they were last year.